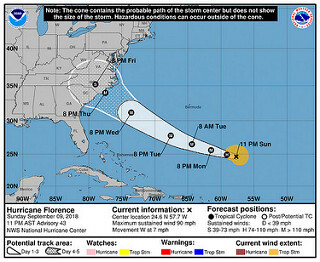 ﻿ Zambians In The U.S Cautioned About Incoming Hurricane Florence | Embassy of the Republic of Zambia in Washington, D.C.
WASHINGTON DC- TUESDAY, September 11, 2018 - The Zambian Embassy in Washington D.C. is advising its nationals in North Carolina, South Carolina, Virginia and Maryland, to be on alert and monitor information on the impending Hurricane Florence expected to hit the regions soon. Mandatory mass evacuations have been ordered along the U.S. Atlantic Coast as Hurricane Florence, a Category 4 storm and the most powerful to menace the region in nearly three decades, barreled toward the region on Tuesday. More than 1.5 million people have been ordered to evacuate the coastal areas ahead of the storm. Governor Ralph Northam issued an evacuation order for about 245,000 residents in flood-prone coastal Virginia beginning at 8 a.m. local time while South Carolina Governor Henry McMaster has ordered more than 1 million residents along his state’s coastline to leave starting at noon on Tuesday. The National Hurricane Center in Miami says the Hurricane Florence, packing winds of 140 miles per hour (220 kph), are expected to grow even stronger before making landfall on Thursday, mostly likely in southeastern North Carolina near the South Carolina border. And Zambia’s Ambassador to the U.S Dr. Ngosa Simbyakula has also urged leaders of Zambian association to raise awareness among the communities about the Hurricane expected to hit the affected areas.